One of the hottest topics in antitrust these days is institutional investors’ common ownership of the stock of competing firms. Large investment companies like BlackRock, Vanguard, State Street, and Fidelity offer index and actively managed mutual funds that are invested in thousands of companies. In many concentrated industries, these institutional investors are “intra-industry diversified,” meaning that they hold stakes in all the significant competitors within the industry. The empirical studies on common ownership, which have received a great deal of attention in the academic literature and popular press and have inspired antitrust scholars to propose a number of policy solutions, have employed a complicated measurement known as “MHHI delta” (MHHI∆). MHHI∆ is a component of the “modified Herfindahl–Hirschman Index” (MHHI), which, as the name suggests, is an adaptation of the Herfindahl–Hirschman Index (HHI). In the leading common ownership study, which looked at the airline industry, the authors first calculated the MHHI∆ on each domestic airline route from 2001 to 2014. They then examined, for each route, how changes in the MHHI∆ over time correlated with changes in airfares on that route. To control for route-specific factors that might influence both fares and the MHHI∆, the authors ran a number of regressions. They concluded that common ownership of air carriers resulted in a 3%–7% increase in fares. sj is the market share of firm j. The complexity of this formula is, for less technically oriented antitrusters (like me! ), a barrier to entry into the common ownership debate. In the paragraphs that follow, I attempt to lower that entry barrier by describing the overall process for determining MHHI∆, cataloguing the specific steps required to calculate the measure, and offering a concrete example. Determining the MHHI∆ for a market involves three primary tasks. The first is to assess, for each coupling of competing firms in the market (e.g., Southwest Airlines and United Airlines), the degree to which the investors in one of the competitors would prefer that it not attempt to win business from the other by lowering prices, etc. This assessment must be completed twice for each coupling. With the Southwest and United coupling, for example, one must assess both the degree to which United’s investors would prefer that the company not win business from Southwest and the degree to which Southwest’s investors would prefer that the company not win business from United. There will be different answers to those two questions if, for example, United has a significant shareholder who owns no Southwest stock (and thus wants United to win business from Southwest), but Southwest does not have a correspondingly significant shareholder who owns no United stock (and would thus want Southwest to win business from United). The denominator assesses the degree to which the investor base (weighted by control) of the firm whose competition-reduction incentive is under consideration (J) would prefer that it maximize its own profits, not the profits of the coupling. Determining the denominator requires summing the squares of the ownership percentages of investors in that firm. Squaring means that very small investors essentially drop out and that the denominator grows substantially with large ownership percentages by particular investors. Large ownership percentages suggest the presence of shareholders that are more likely able to influence management, whether those shareholders also own shares in the second company or not. Having assessed, for each firm in a coupling, the incentive to soften competition with the other, one must proceed to the second primary task: weighing the significance of those firms’ incentives not to compete with each other in light of the coupling’s shares of the market. (The idea here is that if two small firms reduced competition with one another, the effect on overall market competition would be less significant than if two large firms held their competitive fire.) To determine the significance to the market of the two coupling members’ incentives to reduce competition with each other, one must multiply each of the two fractions determined above (in Task 1) times the product of the market shares of the two firms in the coupling. This will generate two “cross-MHHI deltas,” one for each of the two firms in the coupling (e.g., one cross-MHHI∆ for Southwest/United and another for United/Southwest). The third and final task is to aggregate the effect of common ownership-induced competition-softening throughout the market as a whole by summing the softened competition metrics (i.e., two cross-MHHI deltas for each coupling of competitors within the market). If decimals were used to account for the firms’ market shares (e.g., if a 25% market share was denoted 0.25), the sum should be multiplied by 10,000. Following is a detailed list of instructions for assessing the MHHI∆ for a market (assuming proportionate control—i.e., that investors’ control rights correspond to their shares of firm profits). List the firms participating in the market and the market share of each. List each investor’s ownership percentage of each firm in the market. List the potential pairings of firms whose incentives to compete with each other must be assessed. There will be two such pairings for each coupling of competitors in the market (e.g., Southwest/United and United/Southwest) because one must assess the incentive of each firm in the coupling to compete with the other, and that incentive may differ for the two firms (e.g., United may have less incentive to compete with Southwest than Southwest with United). This implies that the number of possible pairings will always be n(n-1), where n is the number of firms in the market. 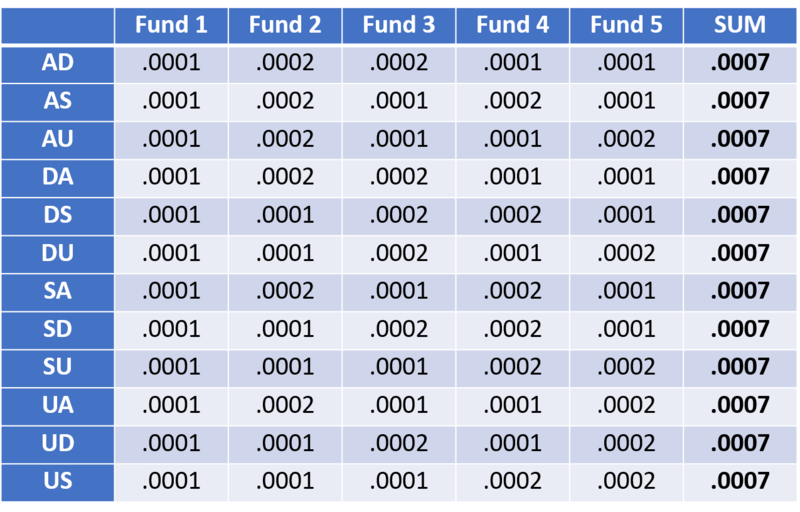 For each investor, perform the following for each pairing of firms: Multiply the investor’s percentage ownership of the two firms in each pairing (e.g., Institutional Investor 1’s percentage ownership in United * Institutional Investor 1’s percentage ownership in Southwest for the United/Southwest pairing). Figure the cross-MHHI∆ for each pairing of firms by doing the following: Multiply the market shares of the two firms, and then multiply the resulting product times a fraction consisting of the relevant numerator (from Step 5) divided by the relevant denominator (from Step 6). Add together the cross-MHHI∆s for each pairing of firms in the market. Multiply that amount times 10,000. I will now illustrate this nine-step process by working through a concrete example. Suppose four airlines—American, Delta, Southwest, and United—service a particular market. 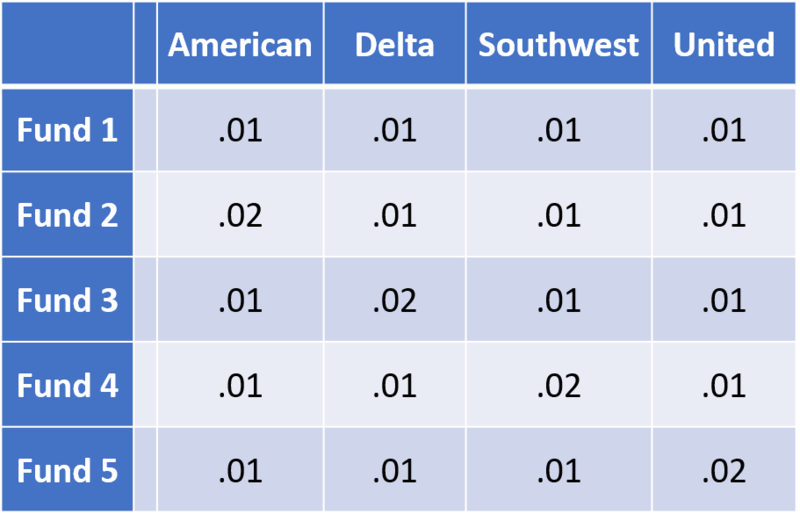 American and Delta each have 30% of the market; Southwest and United each have a market share of 20%. Five funds are invested in the market, and each holds stock in all four airlines. Fund 1 owns 1% of each airline’s stock. Fund 2 owns 2% of American and 1% of each of the others. Fund 3 owns 2% of Delta and 1% of each of the others. Fund 4 owns 2% of Southwest and 1% of each of the others. And Fund 4 owns 2% of United and 1% of each of the others. None of the airlines has any other significant stockholder. Step 1: List firms and market shares. Step 2: List investors’ ownership percentages. Step 3: Catalogue potential competitive pairings. Steps 4 and 5: Figure numerator for determining cross-MHHI∆s. Step 6: Figure denominator for determining cross-MHHI∆s. Steps 7 and 8: Determine cross-MHHI∆s for each potential pairing, and then sum all. Step 9: Multiply by 10,000. Not only to BlackRock, Vanguard, State Street, and Fidelity increasingly own the entire market, they also own each other. This is a useful primer on the calculation of the MHHI in instances of common ownership. But one might note that the MHHI effect on competition is far from settled economics or law. In my view, it’s far too early in the “discovery process” to conclude that antitrust enforcement policy should incorporate an assessment of horizontal shareholdings going forward. As helpful as it is, this discussion of the MHHI calculations might be viewed as an endorsement of such a policy change. I suspect that was not the intent. Having said that, the empirical analysis of horizontal shareholdings is certainly intriguing. Thanks for the comment, John. Yes, I should have clarified that this is NOT an endorsement of MHHI delta as an appropriate means of measuring the competitive effects of common ownership. As Mike Sykuta and I explain in our recent paper on common ownership (the first link in the post above), MHHI delta suffers from endogeneity problems. Nor do I intend to suggest that the common ownership problem, if it exists, warrants an antitrust fix. I just wanted to explain the MHHI delta metric for people who are finding the literature hard to follow. It took me some time to get my head around the measure. Wanted to save folks some of the hassle!